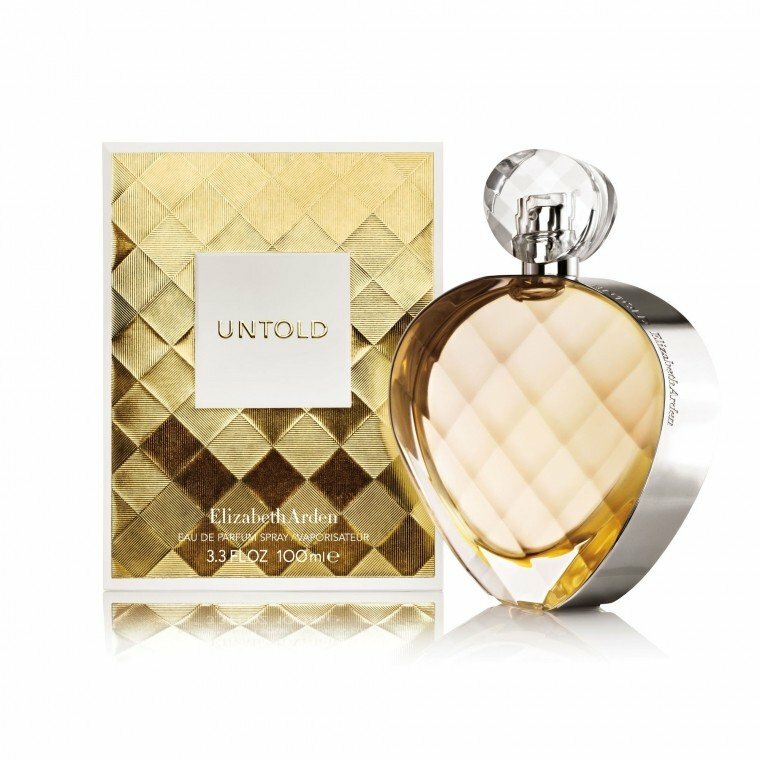 Untold is a perfume by Elizabeth Arden for women and was released in 2013. The scent is floral-fruity. It is being marketed by Revlon. Subtle, yet more complex than it gets credit for. I was immediately struck by the commercial for Untold. I just loved that song (which strangely still pops into my head on occasion). I googled all over the place to figure out who or what it was (to no avail). At the time, I didn't care much about perfumes. I had a couple drug store staples and Bath & Body Works mists. I sung along with the song when it happened to come on TV, and otherwise forgot all about it. Well, one of those drug store favorites had been discontinued for some time, and the price on eBay is only getting higher and higher. While browsing around online, I remembered that commercial.. that song. Untold! I should see if it looks as magical as the commerical made it out to be. I first bought a mini. Initially, I could smell nothing but pears. I had never even tasted a pear before - but every time I wore Untold, my teeth would chatter and my mouth would water and I just wanted to bite something, haha! I ended up going to the grocery store to buy a pear, and ate one for the first time in my life. Now, I love pears! And, I also love Untold. I got ahold of a large bottle (for just $10 on eBay! ), and quickly began to appreciate its other notes. While pear has the leading role here, the florals sure soften it up, the amber and musk provide warmth and creaminess, but my favorite part is that subtle spiciness! Ugh, just delightful, understated, delicious! It may not be as bold as most of my favorites tend to be, but man, it's a truly remarkable scent in an utterly gorgeous bottle! Bland and unimaginative. As if someone mixed "Trésor in Love" with "Daisy", and tried to cover up the effort by adding some loud and unpleasant artificial woody base (musk, amber...). This story has been told so many times before that it seems unnecessary to write about this linear, synthetic fragrance at all (for a deep analysis, take a look at FloraMilena's outstanding review below). The bottle isn't bad, though. Wish some more creativity would have gone into the making of its contents. Opens on me with a raucous blast of sweetened dessert pears floating in a viscous corn syrup broth sprinkled with a tad of rosy pink pepper, a dusting of bergamot, and a hint of acidly urinous cassis. To this is added a central white floral core of weighty jasmine/gardenia that is surprisingly non-indolic, but unfortunately, also very inelegant, ungainly, and ponderous. The white floral accord here is bizarre in that it lacks all ethereal beauty, strength, and headiness in spite of the lack of indoles. An unpleasant whiff of harsh peony does not smooth the rough edges and rather serves to underscore them along with the cassis. The dry down proceeds to descend into a quagmire of thin and non-herbal, and sickly patchouli, a lackluster musk which wouldn't even pass muster as a sedate skin scent, a nondescript amber that does nothing but add to the general cloying staleness of the mix, and finally an anemic sandalwood accord that only serves to anchor the dessert without adding anything really woody. Everything that could possibly be a negative in the accords manifests on my skin with this one. Even the reformulated 5th Avenue, which is a pale shadow of its former glory is light years ahead of this one in terms of basic compositional white floral balance, headiness, and beauty. Those that enjoy fresh scents will probably wrinkle their noses as I did at the unattractive lack of transparency in the florals and everything else here. Those that love the ultra-rich and dark resinous musk blends will most likely shrug their shoulders indifferently at this one. You might like it if you want an opaquely sweet floral without aldehydes. I can’t call it a gourmand either so it doesn’t really fit for the food-lovers either. A very strange smell this one is on me. Oh well, a learning experience. C’est la vie. Write the first Review for Untold!